Universal Partnerships & Licensing has tapped Cookies United to create a line of decorated cookies and cookie kits based on the upcoming Minions movie. A spin-off of the Despicable Me franchise, Minions will be released July 10, 2015. Cookie United’s line will hit shelves in conjunction with the film’s premiere. 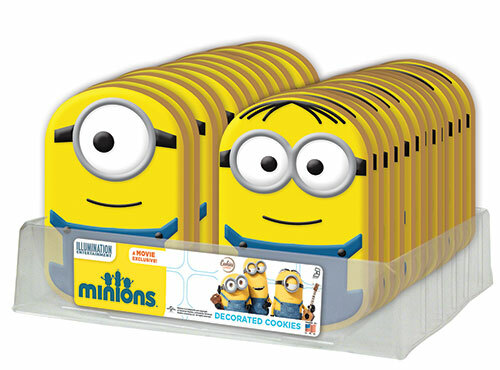 “Our team is very excited to create an all-new line of decorated cookies and cookie kits for Minions, and we look forward to an ongoing and mutually beneficial relationship with Universal Partnerships & Licensing and Illumination Entertainment,” says Lou Avignone, chief executive officer, Cookies United. Cookies United LLC Signs License with Universal Partnerships & Licensing for Cookies and Kits Based on Universal Pictures and Illumination Entertainment’s Upcoming Film Minions Long Island, NY, DATE – Cookies United LLC, a wholly-owned subsidiary of United Baking Co., Inc. (the manufacturer of the Uncle Wally’s brand of baked goods), has signed a licensing agreement with Universal Partnerships & Licensing to manufacture decorated cookies and cookie kits based on the upcoming Minions movie, a spin-off from the phenomenally successful Despicable Me franchise. Minions will be released on July 10, 2015. “Our team is very excited to create an all-new line of decorated cookies and cookie kits for Minions, and we look forward to an ongoing and mutually beneficial relationship with Universal Partnerships & Licensing and Illumination Entertainment,” said Lou Avignone, CEO of Cookies United. Minions tells the tale of Kevin, teenage rebel Stuart and lovable little Bob, who embark on a thrilling journey to find a new evil boss, that takes them from frigid Antarctica to 1960s New York City, ending in mod London, where they must face their biggest challenge to date: saving all of Minionkind…from annihilation. Featuring a soundtrack of favorites from the ’60s, Minions is produced by Illumination’s Chris Meledandri and Janet Healy, and directed by Pierre Coffin and Kyle Balda. The film stars Academy Award®-winner Sandra Bullock, Jon Hamm, Michael Keaton, Allison Janney and Steve Coogan, and opens in theaters July 10, 2015. Products will be available on shelves in summer 2015. Illumination Entertainment, founded by Chris Meledandri in 2007, is one of the entertainment industry’s leading producers of all-audience event films. In July 2010, Illumination, which has an exclusive financing and distribution partnership with Universal Pictures, released its first film, Despicable Me, starring Steve Carell, which earned more than $540 million worldwide and launched a beloved global franchise. With the success of 2011’s Hop, 2012’s Dr. Seuss’ The Lorax and 2013’s juggernaut Despicable Me 2— the highest-grossing first-run film in Universal’s history and the year’s third-highest-grossing film at the worldwide box office—Illumination’s films have made almost $2 billion. Universal’s and Illumination’s next film, Minions, a spin-off of the phenomenally successful Despicable Me series—starring Academy Award® winner Sandra Bullock and Jon Hamm—arrives in theaters on July 10, 2015. In 2011, Universal Pictures acquired the animation division of French visual effects studio Mac Guff Ligne and formed Illumination Mac Guff to work exclusively on Illumination Entertainment’s fully CG movies. Fans may also experience Minion Mayhem in 3D with the Ultra-HD movie motion simulator adventure at Universal Orlando Resort and Universal Studios Hollywood. This entry was posted in Cookies United Blog, Press Releases, Product Announcements. Bookmark the permalink.